These keto-friendly muffins are hands-down one the best gluten-free, low-carb muffins out there. Even with only a trace of sugar per serving (sweetened with stevia), these muffins really taste like a treat worth getting out of bed for. They’re fluffy and moist with a smooth cake-like texture, proving once and for all that you don’t need white flour, sugar, or a long list of not-so-natural ingredients to make a genuinely delicious muffin. The main ingredient list is short: almond flour, egg, butter and whipping cream, plus the necessary salt, baking soda and baking powder. 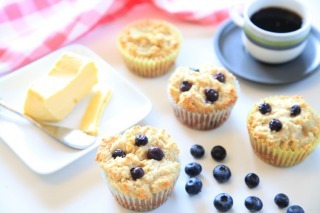 A little almond extract and liquid stevia add flavor and sweetness, but honestly, you can omit sweetener entirely and the muffins still turn out great—especially, if fresh blueberries are added. 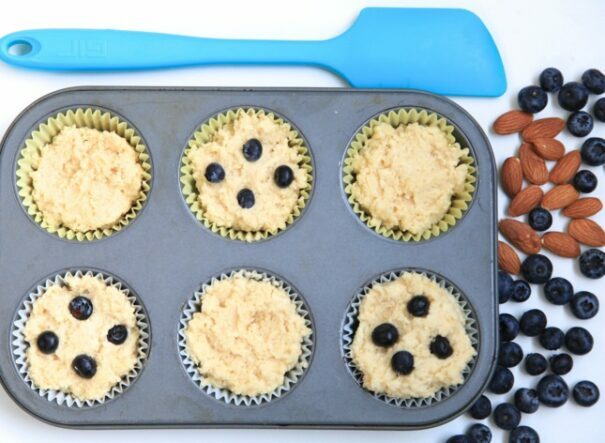 Heat your oven to 375 °F/190 ºC and line a muffin pan with 9 liners, or use a silicone muffin pan. Whisk together almond flour, baking powder and salt. In a large bowl, whisk together butter, heavy cream, egg, almond extract, stevia and baking soda until smooth. Combine the almond flour mixture with the bowl of wet ingredients, stirring gently to combine. The batter will be thick. Spoon the batter into the muffin tin, filling the cups almost to the top (this recipe makes 9 muffins). Bake until the muffins are lightly browned on top and a toothpick inserted into a muffin comes out clean, about 16 minutes. Allow muffins cool for 10 minutes in the pan before eating. For optimal freshness, store these keto muffins in the refrigerator. < Previous postFrom Skinny Fat to Healthy Fab! Can you share your recipe for the cookies? Adrienne, so sorry just saw this comment. If you go to my Instagram account @happyhealthyandhot_elizabeth there is a link in my bio for “happy, healthy and hot treats.” Click on that and you’ll get the chocolate dipped coconut cookies and a few others! If one opts not to use the blueberries in the recipe “½ cup fresh, small blueberries (optional) (70 g)”, would the recipe then have a different name …. ? How many carbs in muffin. Was wondering that too. Anyone calculate the nutrients in this? We figured the carbs out to be roughly 8g per muffin. 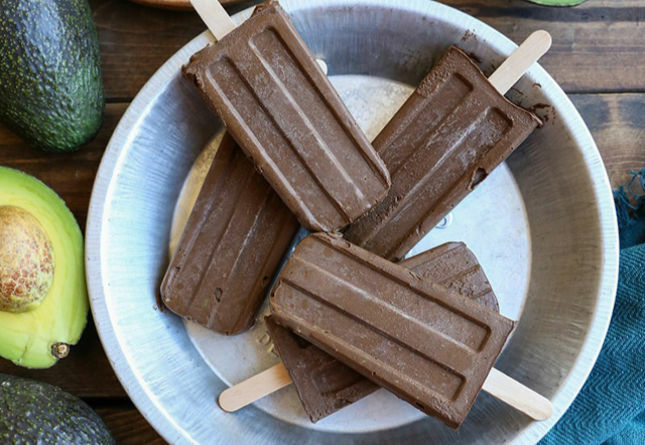 These are really good–hard to not eat them all! With about 1/2 cup walnuts added I got 12 servings…Used this site to calculate and got 1.6 net carbs per muffin. I also used 3/4 cup unsweetened frozen blueberries. anyone know a good substitute for cream for this recipe? I’m dairy-sensitive. Can handle butter but try to avoid heavy cream. Ah great idea, that will be delicious, thank you! Do you substitute the coconut cream for heavy cream 1 to 1 (3/4 cup for 3/4 cup)? Thanks. Full fat coconut milk instead? I love blueberries, and these do sound as good as they look. Still, I find it a better idea, at least for myself, to avoid the mindset of “needing” a repertoire of substitute treats. 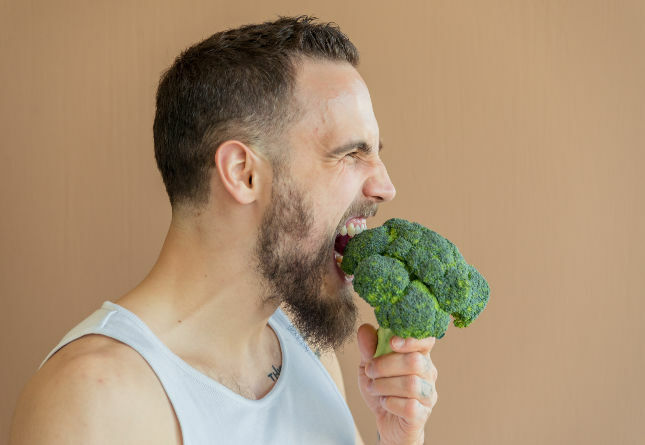 As a former sugar addict, I have long since shifted my preferences to other foods. My idea of a treat is more along the lines of a glass of unsweetened iced tea with a slice of lemon or a really good steak dinner. I suspect the attitude adjustment is one reason why a Paleo diet has worked so well for me. I definitely think that substitute treats can be a real trap. You just won’t see the full benefits of a paleo/keto diet if all you do is eat “healthy” junk all day. However, I’ve been keto/LCHF for some time now and did the first year being quite strict keto. Knowing that this was my new lifestyle, and not just a fad, I started to incorporate a fuller menu, which includes keto baked goods. After my repertoire became fuller my hubby joined me in being keto and the kids now eat LCHF at home and because we still have muffins and bread and pizza (all keto) as well as quality meats, vegies, dairy and fermented foods, food is just not an issue. Non-keto friends will dine with us without a second thought and no disclaimers or explanations are necessary. 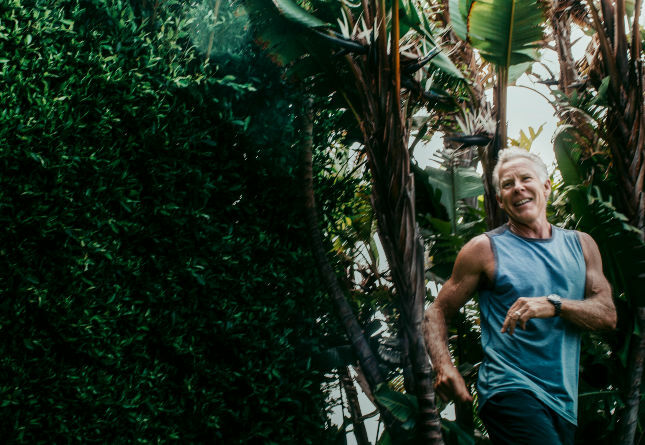 No one feels deprived and we just live our lives without food being such a focus – which I think is the ultimate goal, not just for physical health, but mental health as well. Just tried these, made them without stevia as I’m trying to get my tastebuds used to less sweetness, and they were AWESOME with a nice pat of butter on them. MMMmmm…. One month into Primal eating/lifestyle (after a previous attempt about a year ago which didn’t even last a month) and loving it this time, noticing some cool physical changes, but realized over Christmas celebrations that I really missed having some type of baked goods as the occasional special treat. Experimenting with recipes now so I can make this a true life-long change this time! Yummy. Sounds good with some hot tea. But they are yummy nonetheless (if a little too sweet), and the time spent together was priceless. Does anyone know the calorie and nutrition breakdown of one of these muffins. They are so tasty! Yes – It would be really helpful if in the future MDA could include nutritional analysis for their recipes. According to MyFitnessPal 323 cals, 5.1g carbs, 30.5g fat, 7.9g protein. saw this recipe on Instagram and immediately made them! I swapped out almond extract for vanilla and added lemon zest as well as 1Tbs lemon juice. Also used coconut milk creamer instead of heavy cream (allergic) and they turned out great! 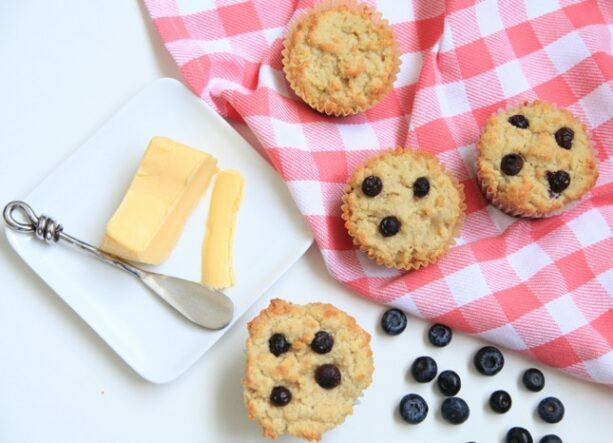 How many carbs are your Blueberry Muffins? Thank you for this great recipe , I just made them , ate one while it was warm . They are great tasting, I used blanched Red mill almond flour , and I also used one half tsp. of vanilla extract instead of almond , I forgot to put the blueberries in them so I put some on top and poured a little bit of heavy cream over it , just a little . They do crumble apart easily , but I ate mine warm , so when they cool they may not . But they taste fantastic . Hi, I’d like to try some of that primal baking, but I’ve got quite an obstacle – I’m alergic to almonds. Is it possible to substitute almond flour with coconut flour or literally any other nut flour? I mean mainly in this recipe but also in others. 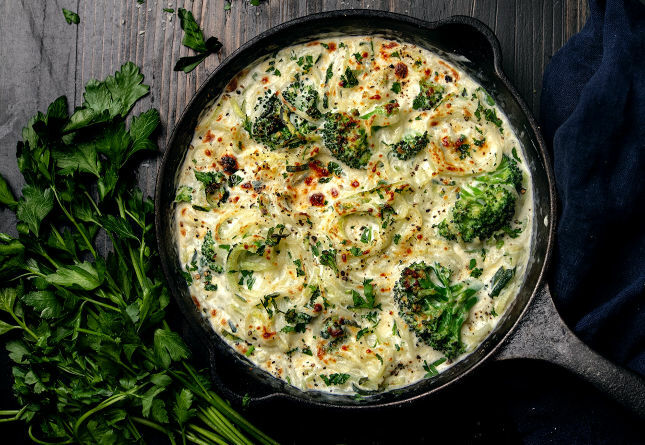 My brother & his wife just started the Keto lifestyle and he sent me this recipe to make for them. Just got home from picking fresh blueberries. The place I’ve been going to for years now they do not put any fertilizer or pesticide on them….Yeah!! Anyways, instead of liquid Stevia would Erythritol work? If so, how much needs to go into these Muffins? OK, am I the only one that has tried to make these and ran into a problem? There isn’t nearly enough liquid. It wasn’t batter at all. More like dry flour than batter. I checked, re-checked, and triple checked. I did everything correctly but I could have almost blown the mixture across the counter with one breath! I have ended up using a ton of Coconut Milk to get it to even resemble a thick muffin batter (as explained in recipe). In oven now…we’ll see…. Just got them out of the oven. Terrible! Had to throw them all away! Can’t wait to make these for my daughter. She is six and I make pretty much everything for her in order to avoid gluten and processed foods. After many years of being primal, I finally don’t care to have one myself. I just tuck them away for her packed lunches and clean up the kitchen. I’ve made hundreds of recipes for muffins but this one looks the best. Thank you!! Sounds like a good recipe! I’m a PHC and sometimes it is nice to have a treat to show my clients when I teach them meal prepping. 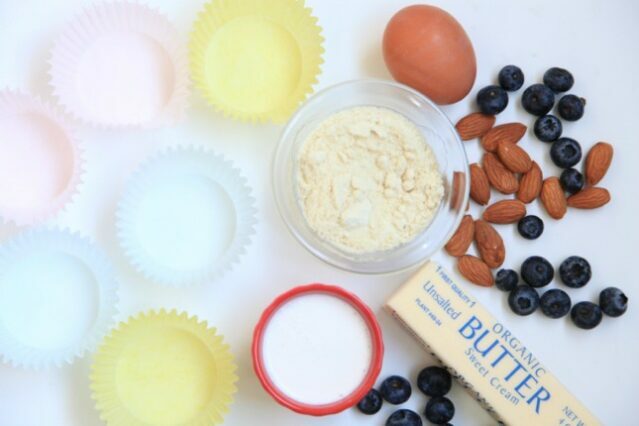 The blueberries are listed in the ingredients but were not mentioned in the instructions section for this recipe. I üst made these and they were pretty yummy. I added lemon zest and a splash of lemon juice. They taste more like a scone than a muffin, but that was a good thing in my opinion!